This device is full-functional vehicle network communication protocol controller, with built-in enhanced CAN2.0B Active module, J1850 (VPW 10.4KP and PWM 41.6KB) controller, and enhanced EUART controller. These three modules can simultaneously receive and send data at a high speed, which can be applied to vehicle diagnosis, signal control, vehicle gateway, bus data monitoring analysis,etc. Development Tools and Eval Board. 1. 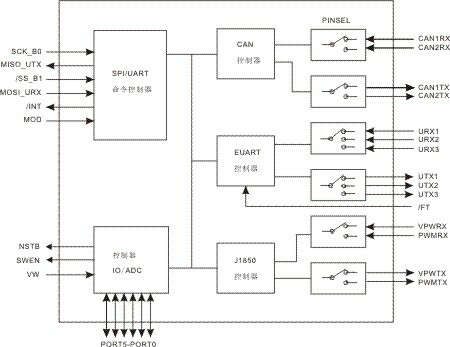 High speed, ET7190 can deal with full load on CAN/J1850/UART bus. Support any application of other industry. 3. J1850 IFR1/IFR2/IFR3,No-error arbitration transmit and receive, automatic hardware synchronization in transmiting. 4. Enhanced EUART Controller,support any UART-based communication on vehicle. 8. All bus drived by Specail Transceiver . Security, stability, specification . 5. Support user-defined frame format, support all manufacturer protocols (KWP1281 J2610 SCI J1708, etc. ), theoretically support any UART-based communication on vehicle. 1. 1-channel 10-bit ADC for measuring voltage of battery.